It seems that every store has a rewards program. It's hard to know which rewards programs are worth signing up for, but the key is making sure to sign up for rewards programs at stores you truly love. 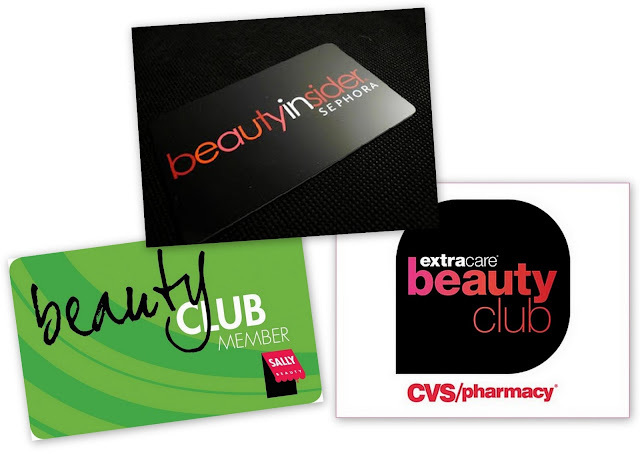 Since I have a variety of beauty rewards cards, I wanted to highlight the three best programs I have found throughout the years. These rewards programs not only save you money, but literally "reward" you for shopping. Although I wish the three following beauty programs were all free, one of the programs has a yearly fee. However, all of these cards are worth having. Let's jump into it! Even though there is a yearly fee of $5 for this card, I must admit that it's my favorite out of the bunch. The reason being is that with this card, you literally save money each time you use it. This card enables you to receive not only the sale prices listed in their weekly circular, but also save on any purchase you make. Although the savings on non-sale items may be small, you do save! Also, sometimes you receive coupons at the bottom of your receipt. CVS provides a free ExtraCare card to all of their customers who are willing to sign up. The best part of this card is that it not only allows you to receive the weekly savings for the overall store, but it gives you the essential tool to sign up for the ExtraCare Beauty Club. The beauty club is a free program you can join if you have this card and it provides great savings. In fact, you receive a $5 coupon for every $50 spent on qualifying beauty products. Spending $50 may sound like a lot, but trust me, it adds up quicker than you would imagine! I tend to purchase my cotton pads, travel items and more from CVS and before I know it, I have a $5 coupon in my email inbox. Also, another great thing is that you can send your coupons to your card so no more printing coupons or forgetting them at home! I highly encourage any Sephora shoppers to get this card. This free card allows you to receive a point each time you spend a $1 at Sephora. Once you reach 100 points (or $100) on your card, you receive a free sample. They typically have great samples. I recently received a sample size of Philosophy Purity that lasted me two weeks. Can you say awesome? Plus, if you don't want to use your points at that time, you can allow them to build. With 500 points, you can get an even bigger gift, which typically includes full size products. Lastly, regardless of how much you spend, with this card, you get a free birthday gift every year from Sephora! I have received body wash, lip balm, etc. Are you a member of these rewards programs? What are your favorite beauty rewards programs? Thanks lady! You should check out the Sally's card. The $5 is returned to you so quickly that it's worth it. Thanks for sharing these reward programs, I belong to the Sephora Beauty Insider program. I have the Sally's Beauty Card but I have to admit that I hardly ever go to Sally's. I always seem to find myself in the neighborhood beauty supply store. I wonder if my card is still active with Sally's? I need some shears so I'll check out Sally's and see how much I'm able to save. I always love the free samples and birthday gift with that card! Thanks for stopping by Chantel! The card lasts a year and I know on my card, they always put a small date stamp on it. I would definitely check and see. They offer some great discounts and sometimes better prices than the beauty supply store. I go there for a lot of my gels and natural hair products because the beauty supply store generally has them marked up at least by $1. I was going to get a Sally's card but when I saw they wanted me to pay to join I declined. Not solely because of the price, but I dont shop there enough to pay money to get perks. I like Sephora's VIB reward program but the monthly point picks are not for my skin tone or hair type and that gets old. I do like Ulta's rewards program, I always get something free I can pick for myself. You know... I do love Sephora's VIB program, but I have to admit that you are right. Sometimes the picks are wonderful and other times they aren't ideal for women of color. The best one I have seen to date was the sample of Philosophy Purity. That became a favorite for me! LOL! Sephora is the bomb. I remember I got the 500 point gift ONE time and it was definitely the business. Totally understandable, but you may want to check it out because when you purchase the card, you typically get a coupon to use for that same amount or better. Plus, they sometimes give you a free product rather than coupon. You tend to get something when you purchase it. I love all three. I agree with you on the Sally's Rewards, they save you so so much.